Last week, on the Jeff Randall show (Sky News), we discussed the looming Greek default but, more importantly, the question of why is Germany dithering. Toward the end of the interview I tried to make the point that Europe’s tratedy is that those with the power to redesign, and in so doing fix, the eurosystem stand to lose a great deal of bargaining power within the eurozone if they do so. Put succinctly, if they use their power (to fix the euro) they will be forfeiting their exorbitant power (within the Council of Europe) to dictate policy to the rest. Thus, they are not using it, with the result that the perfectly save-able eurosystem is crumbling all around us. I see your point that Germany has a lot of power and is the main opponent of a transfer union critically. First of all compared with its real life importance France dictates its will on all others. In reality France is meaningless. It has nothing. 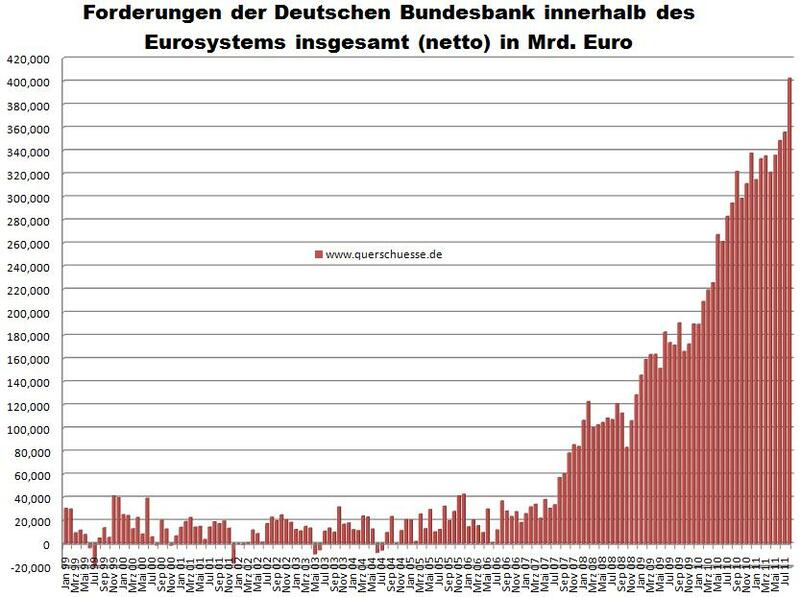 No banking industry like the UK, no manufacturing like Germany. Second Slovakia, Finland and The Netherlands will bring down the new bailout package and the ESM. Maybe it is not so prominent in the press, but you will see it very soon. It is very unlikely that the Euro can be saved. No currency union in history survived, so why should the Euro? This would make it very reasonable for the “North” not to give up power in the future to save it. If the options are (1) immediate crisis or (2) no immediate crisis but eternal enslavement (= pay for the “South”) most people with children pick option (1). So I assume that on October 3rd, not only the Germans will be celebrating the day of reunification, but many people in the Netherlands, Slovakia, Finland and Austria will celebrate the day that the Eurozone broke up! If they are true supporters of Direct Democracy they should adjust considering the situations ,thinking more globally ,since it is already happening ,until a transition can be made for their local actions of direct democracy. Otherwise they have only the name ,but not the spirit and the ability to put themselves in the shoes of others. Small remark: I assume you mean the European Council or the Council of the European Union? Hello Yannis, one question on your last remark about the lack of willingness to form a pan european body to deal with the around-the-corner banking liquidity crisis.Isn’t it enough to have liquidity lines from the FED to the ECB, the bank of England and the Swiss one available?Isn’t that enough to provide a fighting chance for the eurozone banking system after a Greek default?Doesn’t that constitute a circling of the wagons, leaving Greece outside? Yanis, I am very much afraid that I share the same pessimism and for precisely the reason which you put forward at the very end. Bank of Greece or Banque de France, or any other central bank in Europe, can not adequately supervise, regulate and safeguard their corresponding local banking systems. This has to be done at a European level. The negative results of such a failure will be felt all the more intensely in the coming years. There is every reason to believe that we are at the end game; world wide; for the current FIRE economic model. In which case, the very best we can do is plan for the tomorrow, soon to be upon us all. It can not be overstressed, and this is not my exclusive personal opinion, but has been expressed by REAL statesmen, real politicians with convictions and a spine, that the political landscape is dominated by career civil servants, administrative souls at best. Regardless their differences, this has been expressed in one way or the other by both, Helmut Kohl as well as Helmut Schmidt. I would go a little further and describe the events as increasingly destructive on any parliamentary democratic structure, a precious and already very fragile structure that would need to be strengthened and not weakened, but what we witness is the acidious cocktail of incompetence, bourgeois ignorance, and vested interests to rapidly dissolve the core fabric that allows democratic structures to evolve. It is substituted by, excuse the slight exaggeration, a ‘totalitarian bureaucracy’ which breaks their own rules as they see fit and is on that ideological acidious power trip, as they are the only people who ‘know what they do’, yeah right, and as they are unelected and unaccountable for, they are secure in their ECB ivory tower. The EU commission, well, you will know what calibers Germany for example happily sends to Brussels, Mr. Oettinger is just the tip of the iceberg. The intellectual and material firepower at the disposal of lobbies in Europe simply outweighs politicians ‘representing the people’ multifold. Perhaps the hardest part is their systematic refusal to allow public inspection of what they are and have been doing, both in the literal sense as well as financial. A VERY good example here in the UK is that it is only the elected party, and then only at the cabinet level, that see the books. All the other elected politicians; particularly those from the election losing parties, do not see anything. There is no proper discourse; no way to see, let along interact with what they are doing day to day. Imagine trying to run a business like that? Impossible. What if Germany has more to loose than the exorbitant power to dictate policy? An illuminating analysis in today’s F.T. ( http://www.ft.com/intl/cms/s/0/4d3c0b1e-e38c-11e0-8f47-00144feabdc0.html#axzz1YKzNDHz9 ) explains that there is much more at stake than negotiating power. Germans must also compromise a way of thinking that, as they believe, has brought them peace and prosperity. How realistic is it to expect that being in a position of power they will irrevocably bind themselves into an arrangement that not only deprives them of that power but also forces them to adopt principles they despise from countries they regard as economically failed? I sometimes have the impression that their economic textbook, for Germans, is something like the bible in a baptist community in the American south. In that context, being in a partnership with them is their way or the highway. Dear Dutch-Jack, We can agree to disagree on almost everything; including the proposition that the Earth is rotating around its axis. But if you have reached the point of questioning the proposition that a new DM or Northern Euro will appreciate substantially vis-a-vis the dollar or the current euro, there is little utility to be had from this conversation. OK, I will use more detail: Switzerland took measures to keep the Swiss Frank at min 1,20 CHF per EUR. If a small country can peg its currency against another several larger ones can certainly do the same thing. Currently the Swiss National Bank gets foreign currency which it can use to buy gold or forieign binds bearing high interest. The national banks of the Northern European countries get entitlemets from the ECB system, which they can exchange in assets bearing interes below the inflation rate. To me it looks like the tax payers of the Northern countries get bend over for the decisions of the idiotic politicians, who did not believe that they would be the first ones in the history of mankind to make a currency union work. Their bold dream allowed for the party in the South we are now asked to pay for. did you actually stopped for a moment to ponder on what that peg means? Did you ask why SNB waited almost 1 year, with chf appreciating 30-40%, getting half their economy and all their exports killed in the process till they put the peg in place? Hint – peg means you’ll keep paying the bills. I keep throwing all the junk I get from speculations in the bad currency in your hands, and you sit there in the middle like an idiot buying everything because you have to hold the line; and the whole world knows there’s an idiot somewhere who buys all junk because he swore to defend a certain level. So we can all happily speculate; when things go sour, we throw the junk in your yard. the root of the problem is that everyone(starting with politicians) is good at economics. It’s some kinda football – everyone knows about it. Leaving aside that the idea of a central bank buying foreign assets(eventually real estate, eh?) is at least funky. A non elected body getting hundreds of billions to invest – good luck managing the corruption. one more thing – you got the initial problem wrong. THE PARTY ALREADY TOOK PLACE! You already payed for it; good morning! You already lent them to buy your goods; your goods are already consumed. They already borrowed from you to the hilt! I seldom laughed harder; try to figure it out… it’s funny afterwards. Vlad, you are right with all your points. But if there are two options (a) get ECB entitlements or get (b) foreign currency I take option (b) even if in both options I get junk! It is better to have the junk quick then have someone who is broke promise that he will deliver junk to you! That in a very optimistic version – thanks to globalization, everything is so entangled it’d be more akin to war. 2. you try to restart the problem economies. Way less costs, way higher risks. Sure, they can start another party with your money – who knows. But that’s true everywhere – the world got so used to “handouts”; all of it(like it’ll be the martians, not us, who’ll pay the bill in the end). And politicians, who are generally stupid, but very adaptive in nature, figured out in less then a century what a good effect a handout has before an election. what you can’t do is what Germany is advocating now – “give us the booze back”. The booze is drunk; the only shape you can get that booze back in is called puke and is a rather unusable form(at least if they think about drinking it). And money to pay the booze don’t exist. But again, option 1 could turn way worse(I guess – no clue, obviously, it’s not an everyday situation, but last time it turned out way worse). Frankly, I think euro was a dumb idea. The only way why Europe is an entity and not just a peninsula of Asia(which we should, looking at demographics and resources) is due to our diversity and permanent bickering which ensured an upper hand and a fast progress. China was above us all the time(logically); but they were united – when a crap string of leaders inevitably came, due to unity, they ended up bein’ kicked by couple of thousand brits from an island the size of stamp on the map. But euro already exists; the party already happened. One way or another, the mess has to be cleaned. Yanis, your last comment suggests to me that the european industrial capitalists are trying to use this crisis to not only to break the neck of the working class and the petit bourgeoisie but also of the financial capitalists. Just three questions (though may both are fairly stupid): first – did anyone force Greece into the euro? and second – Why there is no mechanism for ejecting non-compliant countries from the euro as well as for evicting states from the EU if they do mischief ( it’s just a question and no nit’s not Greece that I have in mind). The most recent rounds of EU expansion- or the better medically-sounding term for this condition, the “enlargment”, is far more appropriate, were purely political undertakings ( actually perhaps not the most recents ones but all the new “acquistions” since 1990 except perhaps for EU’s Anschlüß with Austria). These acquisitions did not benefit the cause of the long term European unity. Some ethnofascist states were “adopted” as long as they were rabidly Russophobe and equally rabidly pro-American (apparently the only criteria that mattered at the time) like the tiny Nazi statelet of Estonia. Many long term political issues were unresolved, grievances and historic injustices (like the Benesch decrees in the Czech Republic) were not addressed. It was done because the EU really wanted the new members and little dwarfs that run it from behind the curtains thought that this is the historic moment and they are the collective Charlemagne or the Charlemagne collective. This whole thing was just hastily pushed through as if it were a land grab which I guess it was. It seems the best option for the present day EU would be to suffer a major catastrophe and die hopefully a not too painful death. A reform from within is something I wouldn’t expect though I do passionately believe in Easter bunny.